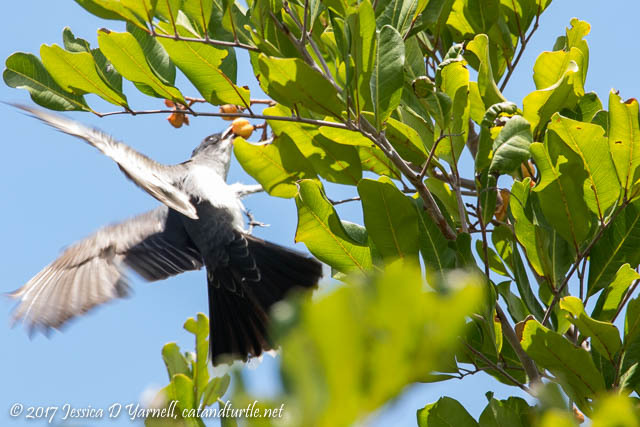 Blog > Beyond the Backyard > Fort De Soto > April Showers Bring…May Migrants! It was raining migrants at Fort De Soto yesterday! The cold front on Friday brought in a nice flock of neotropical migrants. 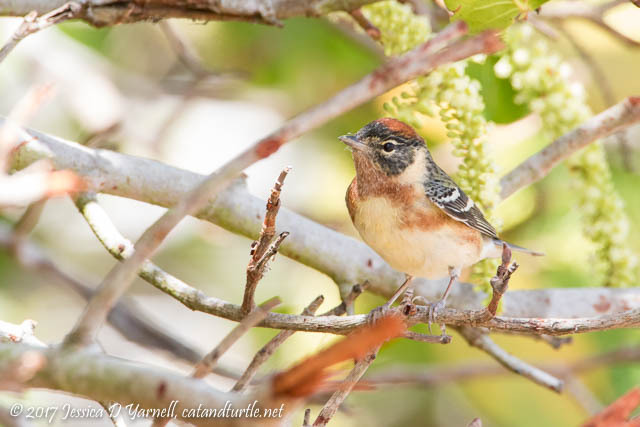 I picked my dad up early and we headed to East Beach, where we found dozens of warblers and other migrants feasting on blooming sea grapes. I must confess that I’d never noticed the bloom of a sea grape before, but to the birds, it was the elixir of life after battling the winds during their migratory journey. 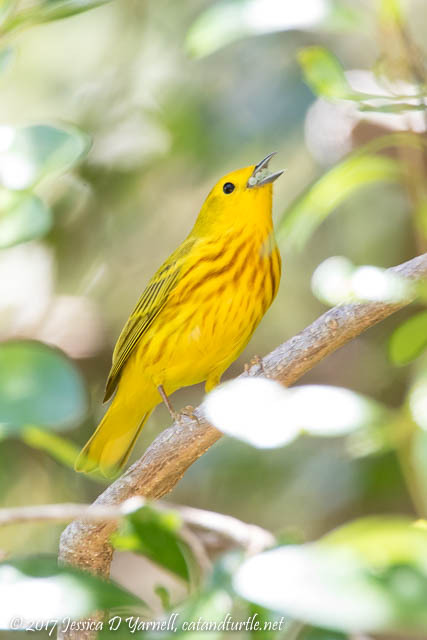 A male Bay-breasted Warbler, a Prothonotary Warbler (not photographed), some female Yellow Warblers, and this Tennessee Warbler were my best warblers at the East Beach road. It’s kind of amazing. When I drove down the road, it looked totally normal. You didn’t necessarily see a ton of birds. But if you stopped and looked, the bushes were just hopping. The report of a male Bobolink led us down the road to the East Beach turnaround. We didn’t see the bobolink, but we spent a few minutes looking at the shorebirds. It was the usual suspects – dowitchers, a few Black-bellied Plovers (some sporting black bellies! ), a Great Blue Heron, some Dunlins. 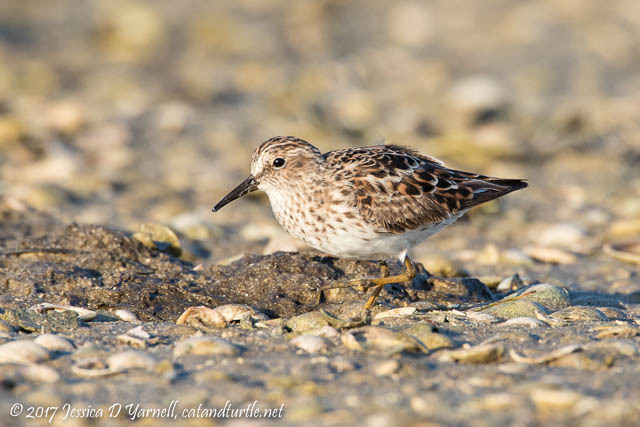 And Least Sandpipers! I’ve never seen quite so many Least Sandpipers! This one is molting into his spiffy breeding colors. We were surprised not to see much activity in the trees in the East Beach picnic area. Then we walked a little way up the Privet Trail in East Beach woods. The winds were strong, and the trail wasn’t as sheltered as the sea grape bushes on the road. 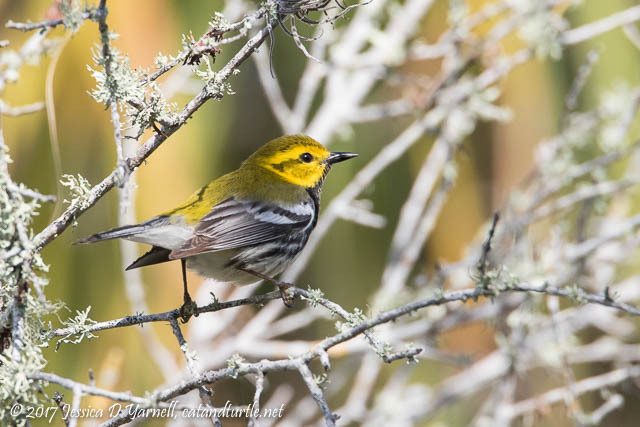 We came across a nice couple with a sweet dog and eagle eyes, who spotted this Black-throated Green warbler for us. Thanks! The woods by the ranger’s house (adjacent to the dog beach) are better known to birders as the Mulberry Tree area. 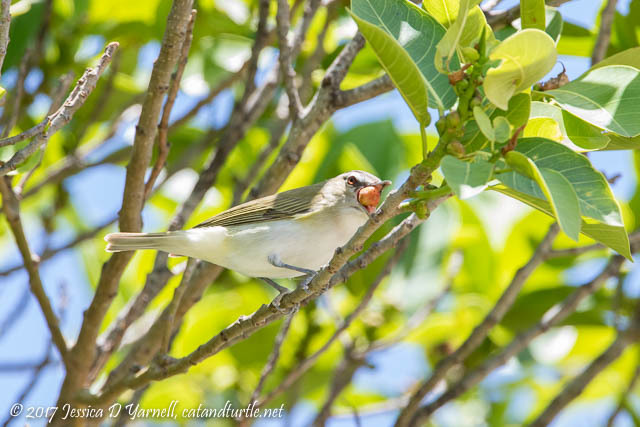 The mulberry trees, fig trees, and a fresh water fountain provide welcome food and water to tired birds who have just flown over the ocean. Yesterday, a lot of the good activity was in the fig tree just beyond the fountain. 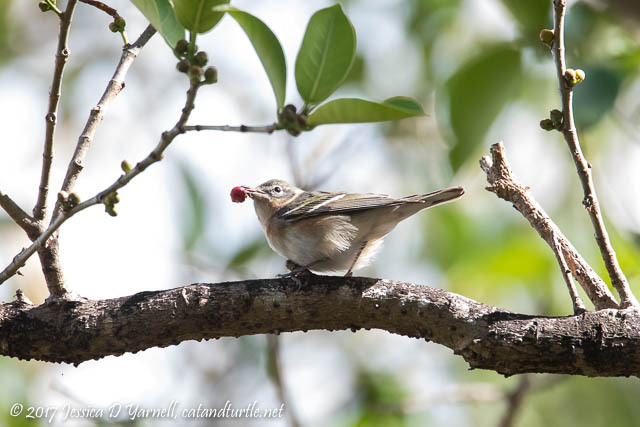 Several female Bay-breasted Warblers were feasting on the fruit. Bay-breasted Warblers are rare at Fort De Soto, and I’d only ever seen one before. So I happily took advantage of the opportunity to photograph more! 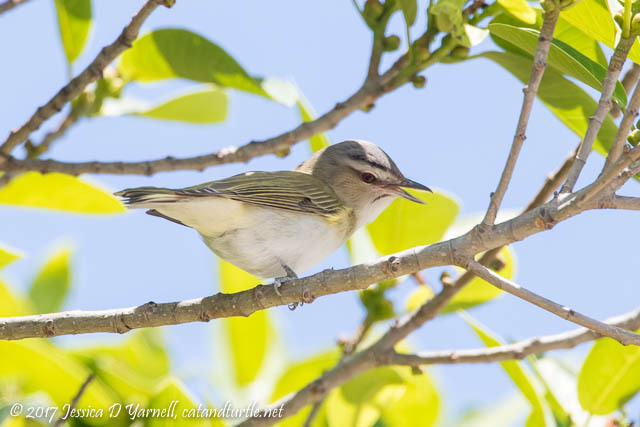 This is the first spring that my dad has gotten to photograph migration at Fort De Soto, so he was collecting lifers left and right. I teased him that I should have put the bell tone from the Big Year movie on my cell phone! 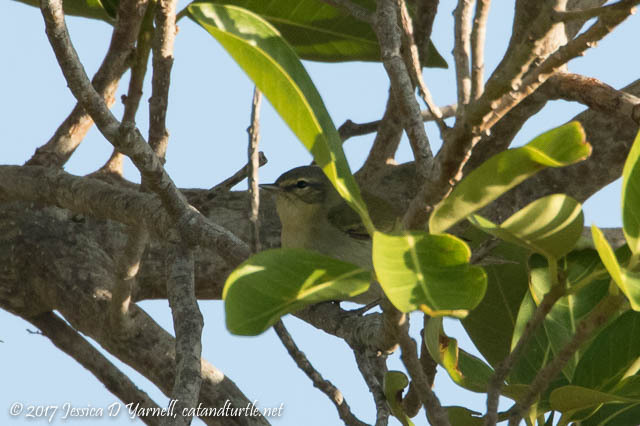 We kept seeing Red-eyed Vireos but they weren’t cooperating for a photo for my dad. So we kept trying…and trying…and finally, a bird sat still for a few seconds! Some of the Red-eyed Vireos were singing. 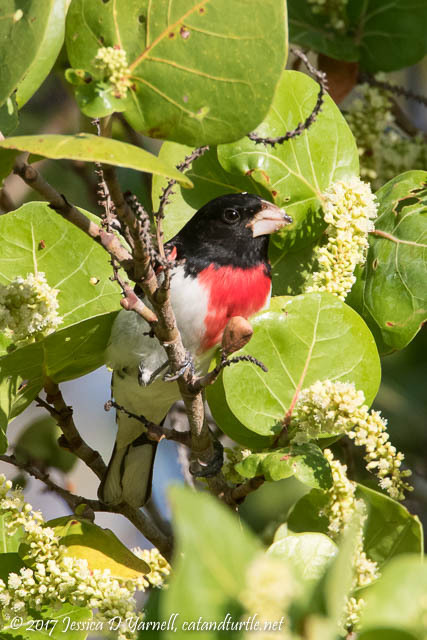 That’s another joy of migration – not only do you get to see rare (to Florida) birds, but you get to hear them, too! It’s such a delight for the senses. 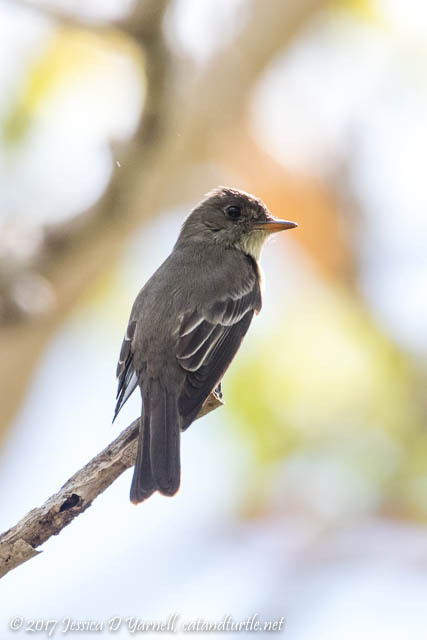 I think my dad’s favorite bird at the Mulberry Tree area was a little Eastern Wood-pewee. Typical of a flycatcher, he kept darting out to search for insects, then returning to the same perch. 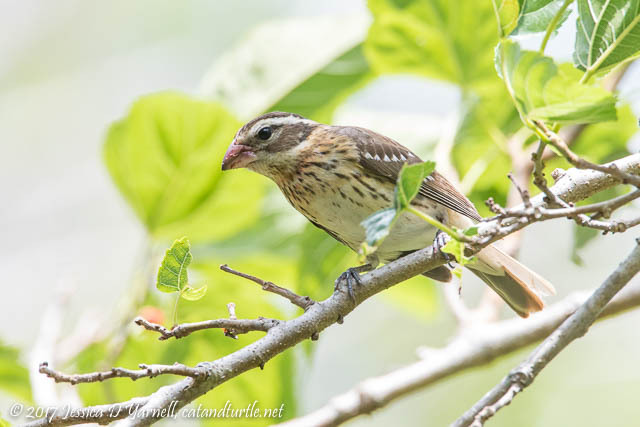 What a treat for a photographer – a bird who behaves with some regularity, instead of darting erratically! 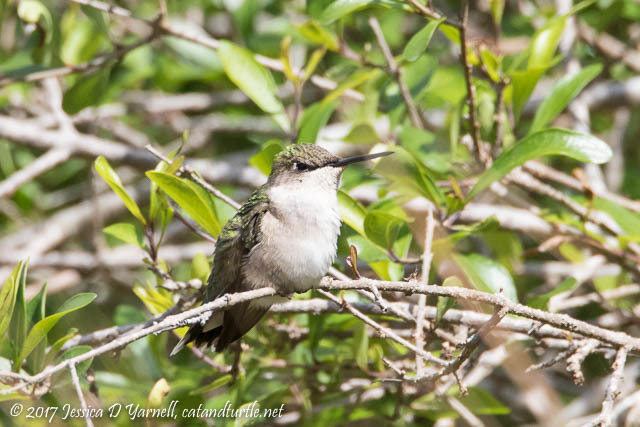 We both enjoyed taking pictures of the little pewee. Such a fun name, and it suits him perfectly. 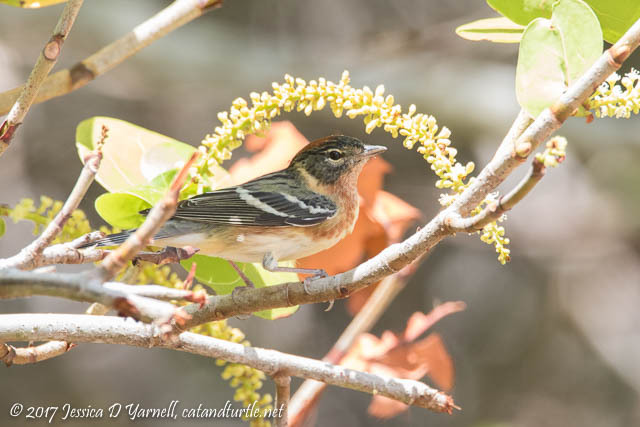 At one point, our attention was divided between the pewee and another Black-throated Green warbler, who obliged us by hopping onto a low branch just over our heads. Look at his tail! 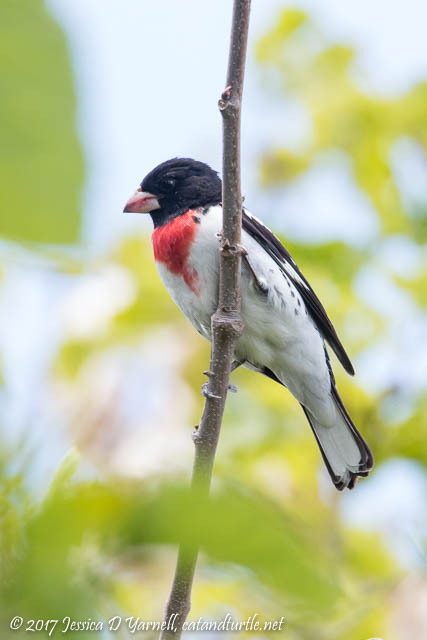 Migration isn’t easy for birds. He managed to fly with just one ragged tail feather. I kind of hope he sticks around until his tail grows back, but for him, it’s a race to the north to claim his nesting area before another bird steals it. 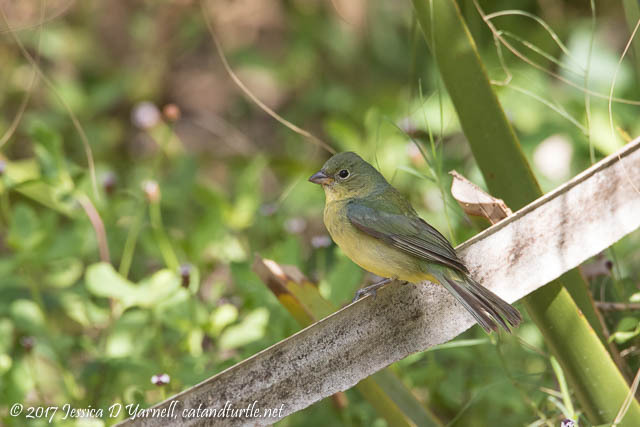 A late greenie Painted Bunting popped out to say hello. I miss my yard Painted Buntings so much already! It was fun to see this greenie. I know they will be back in the fall, but October is so far away! 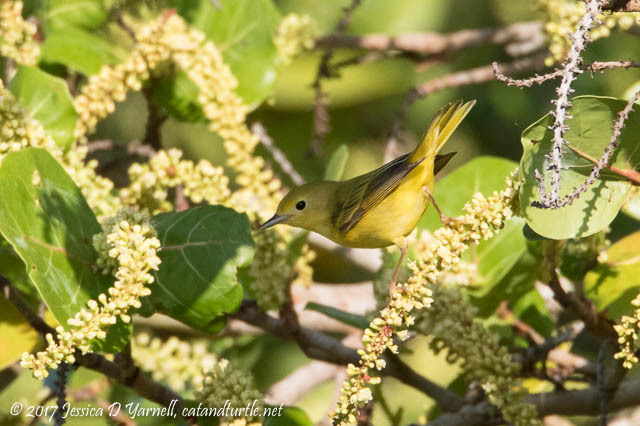 A flash of yellow brought my attention to a bush, and when my dad and I moved closer, we found this beautiful male Yellow Warbler with his mouth full. I’m not sure what exactly he is eating – it looks like insect eggs to me. But boy was he enjoying them. This is one of my favorite shots from the day! We wanted to stop by East Beach again on our way out, but it was hard to tear ourselves from the mulberry trees. We’d start walking back to the car, then get distracted by a bird, and stay for “just a few more minutes!” These Rose-breasted Grosbeaks were my favorite distractions. 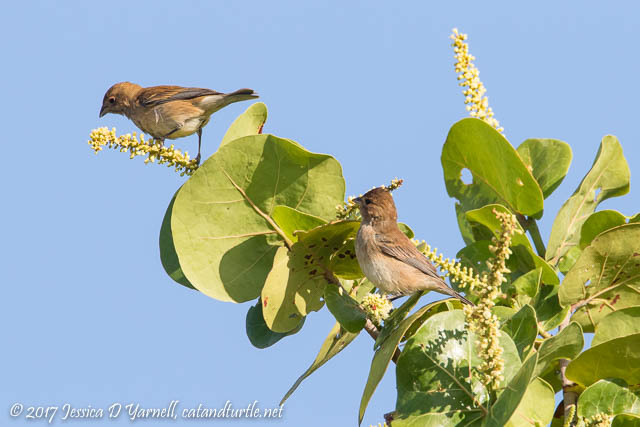 The bushes were still hopping with birds as we stopped by the sea grapes again. 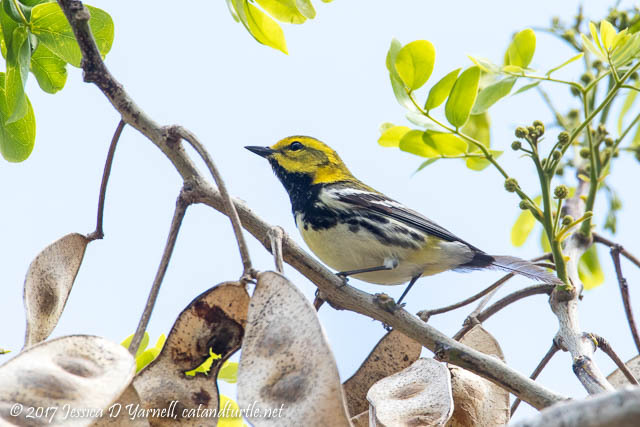 This time the Bay-breasted Warblers were more cooperative, and they hopped out to sip on the sea grape bloom and pose for the camera. It was so cool to see so many of this rare bird. Here’s another photo, just for good measure! 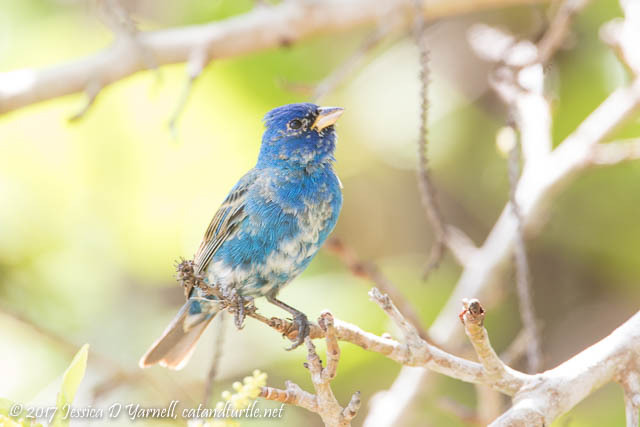 The bushes were still full of female Indigo Buntings. I guess the Indigos are one of the species where the males and females migrate separately. It’s funny how some birds migrate alone (hummingbirds), some in family groups (sandhill cranes), some in huge flocks (snow geese), and in some species, the different genders migrate separately. It’s all about survival of the fittest, and I guess different tactics work better for different species. But luckily for me, there were a few male Indigos around…and one showed off his molting feathers for my camera just before we left! Looks like you had a great day!!! Great photos and story, Jess. It was a great day! I was disappointed that I didn’t run into you or any of the Orlando photography gang. Some of the Lakeland folks were there. Birding Bonanza! Photographic Pheast! Dazzling Day! Thank you for sharing with those of us who wept openly at not being able to get over there. Haha, I feel your pain. My dad got to see all the tanagers the week before and I had to work!! That was a fun morning. It doesn’t happen often. Great to see you again. It’s been way to long. i need to get over to your side of the state soon. Beautiful shots. The bay breasted shots really show the color. It was great seeing you too. I hope you got to see the Black-throated Blue warbler. We missed it… There’s always got to be a reason to go back and keep looking!